It's an awe-inspiring morning. The sky seems painted by God's own hand. There are subtle clouds standing by, letting the sun shine through. The breeze blows softly letting us know that Spirit embraces us, that we are not alone. For the past few weeks, this beautiful island I live in has been drenched by rain almost every day. 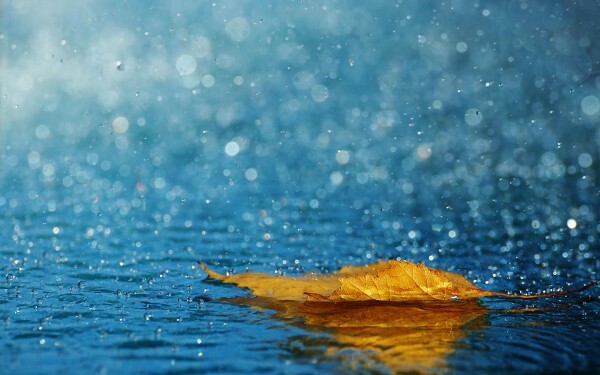 When it rains, I remember the amazing gift of opportunity, of the chance to begin again. When it thunders I feel alive, I feel the power of extraordinary creation. The magic of rain, thunder and lightning comes through in inspiration to write, to do something better, to love more intensely, to forgive, to be alive with all my senses. Yet I realize that for some, the rain evokes sadness. I have felt that way too. A few days ago, during my morning drive, gray clouds hung in the sky. They went from ashy-white to dark gray. I didn't feel the joy, until I noticed that each was lined in silver and that behind those clouds, there was the sun. I remembered that it will not always rain, it doesn't always rain. As I sip my coffee, enjoying the tender warmth of the break of day, I drink it all in–the coffee, the light, the gentle wind, the vibrant colors of this canvas, the birdsong, the stillness of the water I sit by. I have a feeling that it will rain again. Yet this moment recharges me. I am ready. My wish is that rain becomes a source of joy and inspiration for you. Today is a good day to remember those who are sad and lift them up in our hearts sending them light, love and hope. May they see the silver lining and feel the breeze of Spirit that joins us all. Gracias, quizás un día acepte que la lluvia no tiene porqué ser triste, e incluso, en ocasiones, da paso a un arcoiris.